My most recent giveaway for reaching 300 followers highlighted a sad trend that I've seen a few times on my other giveaways and got me thinking about the giveaways that I enter and most likely what other giveaway hosts experience. For that particular giveaway, I had 51 comments posted...2 were from my sister Tina who didn't want to be entered into the drawing especially since she was part of the reason for the post in the 1st place, 1 comment was from an adoption friend who found this blog and who doesn't sew and a whopping 6 commenters weren't followers of my blog. Yes I most certainly do check! Although they posted nice comments, since the giveaway was to celebrate my reaching the 300 followers milestone, it was open to only those that actually follow. Sadly all 6 of those commenters weren't eligible to be entered into the drawing. That bring me to the reason for this post. If you are going to take the time to enter a giveaway, please Follow the Rules! Anyone that hosts a giveaway is doing so out of the goodness of their heart, they pay for the item(s) and the postage to send the prize to you. They certainly should be respected by all those who enter for a chance to win by following the rules they put in place for the giveaway. Perhaps you don't care for the rules they have set. So don't enter! It is their choice after all what rules they pick when they offer up something for free. There is nothing that says you have to enter just because someone is hosting a giveaway. There are many giveaway opportunities that I pass up because the prize isn't something that I'm interested in, they require you to enter via a post on Facebook or Twitter (I don't do either). Checking every single entry takes time and I'm sure all the other giveaway hosts are busy just as I am so if you are going to enter a giveaway, do as the hosts asks in her rules. So please in the future, make sure you do as the giveaway host requests. You'll be doing all of us a favor and you might actually win since you did the right thing and Followed the Rules. 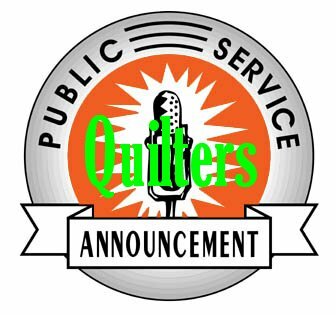 This post has been brought to you by the Quilter's Public Service Announcement Network. Thank you for posting this. I heartily agree. great PSA Michelle, couldn't agree with you more. I haven't offered any give a ways at this time but notice that times that there could be a give a way I get flooded with traffic and little commentary on the blog posting. I know people are busy and might be following many many blogs but fishing for freebies is anoying esp thoes that give you like 12 options to enter -- I feel that real comments often get lost in the shuffle. Well said! As a giver and a receiver I totally agree! Nice. You did a good public service announcement. I promise to follow all the rules. I totally understand. Some people just enter to "win". Just so you know... 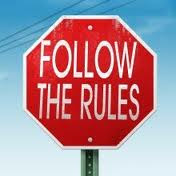 I'm going to follow (stalk)you regardless just because your blog always has something fun going on. Congrats on your 300+ followers. Great job, Michele! I don't have a blog of my own, but I really enjoy the blogs that I follow. I know that the prizes that are offered comes from their heart and it means a lot to me that they are being so generous. 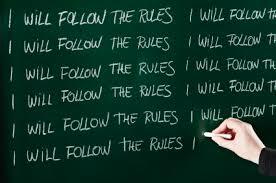 So I think that it is only right that we follow the rules.So thank you for all the time and effort that you put into all that you do. I have noticed on many giveaways that some of the people who comment seem to not have read the rules at all. For example fat quarter shop has a giveaway for Quilting day (I believe) and the rules list going to the shop and posting a link to the item you want to win. Several of the comments did not have a link and some comments were rather generic (woot, thanks for the giveaway)with no item at all. I didn't enter the giveaway, but I don't really get how all the following works. I don't use blogger, so I don't think I am listed as a follower. I am subscribed, however, in my reader to your blog. So maybe some of the people who posted are followers or thought they were followers, just not blogger followers. Blogger is a PITA also because of all the no reply business and I have to do all this verification just to post this reply to your blog. You shouldn’t have to use Blogger to be a follower. You just need a Google log in. I don’t have word verification so I don’t know why you would have to do that to comment on any of my posts. Interesting....I thought I was a follower too as I get your posts in my daily blogger scroll, but realize when I clicked the followers that I was not listed. I have corrected that (RKJRK5). Yeah I think the world of blogging is changing with the google reader change and I think some people were ahead of the change and following us on other avenues that we weren't and aren't even now aware of such as all the other RSS feeds. When I switched to bloglovin I already had people following me over there. How was I to know they were there? Not to mention how does one know how many people follow thru email? Your follow button only shows GFC followers right? Just food for thought. 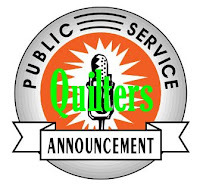 I do appreciate the Quilter's Public Service announcement to follow the rules though...thanks!!! Great food for thought. I don't follow for the sake of a prize, blog hopping does expose new to me bloggers. I host give aways for current followers and then just open ones - it's like advertising, but not necesarily to gain more followers. It is always the handful of faithfuls that respond to your posts, but there are a lot who are 'readers' who love to see what you are up to , but don't like to leave a comment.